This 2700 sf home is located on the beautiful Kenai River Waterfront in Cooper Landing, Alaska. We are a fully furnished 4-bedroom, 3-bath home. It is perfect for several couples, fisherman groups and families. Your King sized Master Suite has a personal sitting area, a full bath with a large shower and a private balcony overlooking snow capped mountains. There are two Queen sized bedrooms with river views, a small bunk room downstairs, a laundry room with full sized washer and dryer, a game room upstairs with two fold down futons. Wireless internet is included. The Kitchen features full sized appliances, custom cabinets, granite counter tops and is furnished for all your cooking needs. The backyard has a screened gazebo complete with table and chairs for outside dining. We also have a picnic area on the river bank as well as a fish cleaning table. 2 full sized freezer is in the garage for you to store your fresh fish. We furnish the coffee and most of the herbs & spices you will need to cook your fresh fish or food you bring with you. Cooper Landing also offers fine dining at the Kenai Princess and fast lunches at Sacketts and Gwen's. A local gas station, liquor and small grocery store and a good outfitter are just blocks away. The world famous Russian-Kenai River confluence is only 10 minutes away. Seward is only 55 miles away and you can charter anything from sightseeing tours to Halibut fishing and you are only a few feet away from World-class Rainbow trout fishing in your private backyard. Fish processing is available right in town. Soldotna is only 45 minutes away and you can find fishing, shopping and the local hospital there. 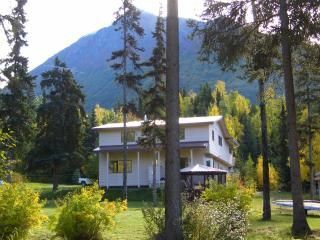 Cooper Landing is possibly the most beautiful spot in Alaska, it is in the Heart of the Kenai Peninsula up in the mountains on the banks of the emerald green Kenai River. If you are looking for the vacation of a lifetime you found it here with us. Info for locals: Our place is accessible by motor boat from Kenai Lake. Down stream form our place is no-motor / float only until you reach Skilack Lake. The bank is low bank and the current is suitable for tie-up and easy access BUT you have got to watch for shallow rocks. The village has many services like a small grocery, gas station, museum, Outfitter, several restaurants and a few shops. Our nightly rates are for up to 4 people with a 25.00 per person per night fee with a max of 10 people total. Sales tax is 15.00 per night and there is a 150.00 cleaning fee. please call if you have toddlers or pets (907)-260-3577 or (210)240-8815 cell Any cancellations before January 1st will receive a 94% refund. All cancellations after January 1st are no refund unless we are able to rebook your dates.